Ted calls time - August 5, 2016 Ted Richard's talks to SwansTV about his career and what lies next for the champion Swan. Ted Richards has announced he will retire at the end of the 2016 season. 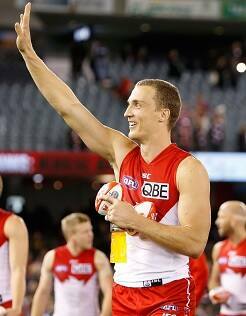 Sydney Swans defender Ted Richards has today announced he’ll retire at the end of the season. Much loved among the red and white faithful, Richards has been a popular and integral member of Sydney’s team for the past 11 years. Richards joined the Club from Essendon during the 2005 trade period with 33 games under his belt. Originally recruited as a forward, it’s been in the backline where Richards has played out the majority of his career and emerged as one of the competition’s elite fullbacks. Arguably, Richards’ most memorable season was in 2012 when he played an outstanding role in the Club’s premiership triumph, was rewarded with a maiden All Australian guernsey and finished runner-up in the Club Champion award. The 261-gamer will continue to pull on the red and white guernsey until the team’s season comes to an end. Senior coach John Longmire says Richards has made a huge impact at the Swans. “Ted has been incredible – he’s really the epitome of a balanced footballer,” Longmire said. Longmire also offered a glimpse into the No. 25’s work ethic. “I still remember in 2010, he was in and out of the team at different times, so he was thinking about making plans to move overseas to live and thought his football career might have been finished. “But instead, Ted dedicated himself to becoming the best defender he could possibly be and went to the whole 2010 finals series to study all of the best defenders in the competition. Ted Richards with wife Ella and son Beau at the SCG after announcing his retirement.